The Bathonian Great Oolite Group is a fossiliferous series of calcareous and argillaceous rocks that are only rarely oolitic in composition. Based upon the collection of physician John Lycett (1804-82), made in quarries on Minchinhampton Common in the Cotswolds, this monograph, written in collaboration with the geologist John Morris (1810-86), covers only that part of the Great Oolite found in this location. However, it also includes species found on the coast of Yorkshire, near Scarborough, which would be included in the Inferior Oolite. The significance of this work is that it is one of just a handful of monographs describing and illustrating the British Jurassic gastropod and bivalve fauna. Having received no significant revision since the late 1940s, it remains a key reference point for Jurassic molluscs. Volume 1 (1850-4) covers cephalopods, gastropods and worms as well as bivalves. 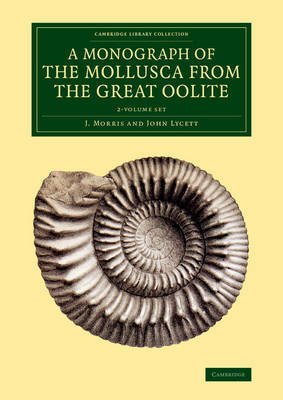 Volume 2 (1863) comprises the supplement covering molluscs in other geological formations.